Who wouldn’t love to visit a cafe that hosts several book club meetings per day? And sells books to boot? This is such a great location, it’s a little disappointing to realize that it is only fiction. In this story, Sassy finds her best friends and room mate the only convenient suspect for murder, and decides to snoop around on her own to clear her pal’s name. Throw in a little family drama at home and a business to run, and she has her hands full! This was a fun story, and I’ll definitely be reading the rest of the series. This is book 3 in the series, but the first one that I had read. While you can enjoy it without reading the first two books, this is a series you might like to start at the beginning to better understand the setup of the cafe and who is who. I’ve already picked up books 1 and 2 to catch up! Be sure to enter the Rafflecopter giveaway (ENDED) for a chance to win a print copy of the book. 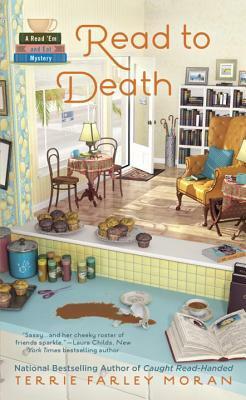 Short-listed twice for The Best American Mystery Stories, Terrie Farley Moran is delighted to introduce mystery fans to the Read ’Em and Eat café and bookstore, which debuted with Well Read, Then Dead . The only thing Terrie enjoys more than wrangling mystery plots into submission is playing games and reading stories with any or all of her grandchildren. Sounds good. Adding to my TBR. I liked this blog so much I decided to follow it. So many of the books reviewed here are books I have bought for myself already. I love finding people who read the same books as myself. This one it’s good! I can’t wait to go back and catch up now…. Sounds like a series to read. Good review. Thanks so much for your kind words about Read to Death. Good luck to everyone who enters the rafflecopter. Hi Terrie – thanks for coming by! Thanks for the giveaway. This book looks so exciting. I’m glad you enjoy the books – good luck in the giveaway!